Many people thought that this day would never come, but it’s official – Russian President Putin will sell his Turkish NATO counterpart S-400 missiles, and there’s nothing that the US or NATO can do about it. This is a profound geo-military pivot for Turkey because it solidifies Russia’s role as the country’s high-level strategic partner for decades to come, considering that Russian experts will be relied on to provide maintenance, repairs, spare parts, and upgrades to these anti-aircraft systems. 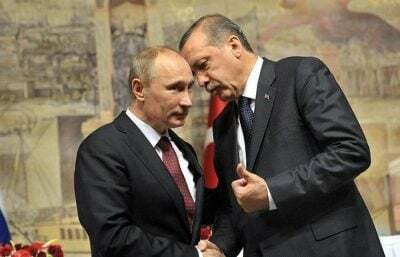 This move didn’t come out of nowhere, however, since it follows a spree of fast-moving steps that President Erdogan has taken ever since the failed pro-American coup against him last summer to diversify his country’s erstwhile Western unipolar dependency with newfound Eastern multipolar partners such as Russia, China, and Iran. Ankara has since largely aligned its Mideast policies with all of these three Great Powers, particularly as it relates to Syria, and even though Turkey hasn’t officially done away with its failed “Assad must go” slogan, it’s all but certain that President Erdogan tacitly recognizes the reality that President Assad won’t be overthrown by so-called “moderate rebels”. In addition, he appears to be much more concerned about the rising Kurdish threat all along his country’s southern periphery as his former US “ally” moves forward with carving a de-facto “second geopolitical ‘Israel’” of “Kurdistan” out of Syria and Iraq. It’s this development, more so than anything else, which is driving Turkey to cooperate even closer with Russia, and it’s very possible that the expedited pace at which the S-400 sale went through is due to the imminent danger posed by what might soon become an American- and “Israeli”-backed “Kurdish Air Force” operating out of northern Syria and Iraq. One needs to remember that the US is losing its decades-old position in the Mideast, particularly in parts of the Gulf and especially Turkey, and it therefore needs to accommodate for the new geostrategic situation ever since the commencement of Russia’s anti-terrorist operation in Syria almost exactly two years ago. There’s been talk ever since last year’s failed coup against President Erdogan that the US might pull out of its Incirlik base in southern Turkey, and some of the Syrian PYD-YPG Kurds were more than willing to invite it into so-called “Rojava” instead. Furthermore, a de-facto independent “Kurdistan” in northern Syria and Iraq would naturally encourage PKK separatist violence in the regions of southeastern Turkey abutting this polity, and if the Kurds were given or sold aircraft by the US and “Israel” for purported “anti-terrorist” purposes, then it’s foreseeable that these assets could end up being used against the Turkish military instead. After all, it’s very unlikely that Turkey would risk its relations with the US to buy Russian anti-aircraft missiles just to guard against non-existent threats from the neighboring states of Georgia, Armenia, Iran, Iraq, Syria, Cyprus, Greece, and Bulgaria. It’s more probable, then, that it chose to go ahead with this move because it already accepted that its ties with the US are irreparably ruined ever since last year’s failed pro-American coup attempt and that its former American “ally” is now actively working to erase the country from the map by supporting the region-wide rise of a so-called “Kurdistan”, complete, as it might even be, with its own “air force” in Syria and Iraq to assist with anti-Turkish strikes in support of their compatriots.